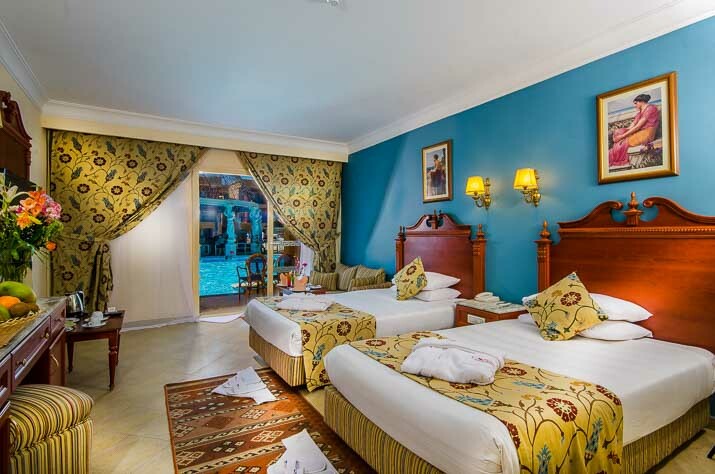 Boasting commanding views over the Red Sea, the Titanic Palace is a fantastic family friendly hotel boasting a huge waterpark, a multitude of swimming pools and spacious, well decorated guest accommodation. There’s a big choice of activities, entertainment and dining, and access to even more at the Titanic Beach. Located 10km from the airport and 17km from Hurghada city centre. The private sandy beach has jetty access for snorkelling. All rooms have a balcony or terrace, king or twin beds, shower, WC, hairdryer, air-conditioning, safe, telephone*, satellite TV and mini-bar*. Standard Rooms sleep 2 adults/2 children. Bungalow Rooms sleep 2 adults. Family Rooms are larger and sleep 2 adults/2 children on king and twin beds. *Some facilities, bars and menu items not included as part of your All Inclusive package may incur extra charges locally.